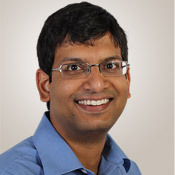 Dr. Natarajan’s research is focused on mm-wave and sub-mmwave integrated circuits and systems for high-speed wireless communication and imaging. He received the B.Tech. degree in electrical engineering from the Indian Institute of Technology, Madras, in 2001 and the M.S. and Ph.D. degrees in electrical engineering from the California Institute of Technology (Caltech), Pasadena, in 2003 and 2007, respectively. From 2007 to 2012, he was a Research Staff Member at IBM T. J. Watson Research Center, NY and worked on mm-wave phased arrays for multi-Gb /s data links and airborne radar and on self-healing circuits for increased yield in sub-micron process technologies. Dr. Natarajan received the National Talent Search Scholarship from the Government of India [1995-2000], the Caltech Atwood Fellowship in 2001, the Analog Devices Outstanding Student IC Designer Award in 2004, and the IBM Research Fellowship in 2005, and serves on the Technical Program Committee of the IEEE Radio-Frequency Integrated Circuits (RFIC) Conference.